Ok, so I said I wasn’t gonna blog today but just got a lil bored sitting at home. 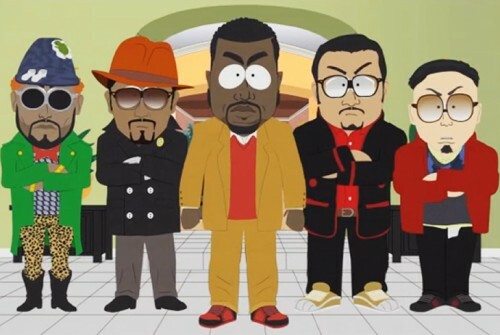 So I haven’t really watched South Park for a hot min but last week I checked out the latest episode where South Park spoofed Kanye West. That episode was soooo damn hilarious I almost died haha, omg I watched it twice and emailed my friends and they almost all died too. The “Fishsticks” joke is genius, you gotta watch it to get the full effect…just thinking about it is making me crack up. At the end there’s a “Gay Fish” song too, be sure to listen to the lyrics carefully, you gotta listen to the Gay Fish (Long Version), dumb funny!. Check out Kanye’s reaction here. 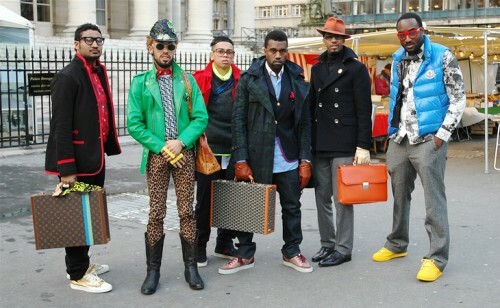 So in this episode they also featured Kanye’s entourage and the outfits were from a pic that Jak & Jil snapped outside of the COMME des GARCONS show during Paris Fashion Week FW ’09. The funniest is Taz’s leopard leggings and in the episode you can see him holding the MCM purse too and not to mention Ye’s shutter shades haha…funny! Enjoy!